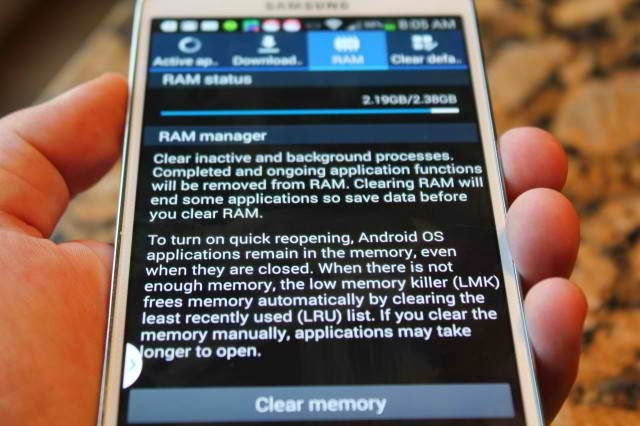 One of the advantages in managing the internal memory or RAM of your Samsung Galaxy Note 3 is that you could prevent freezes and lags especially when you're multi-tasking. This post will serve as your guide on how to manage the internal memory of your device well. This is the most basic of all the processes mentioned in this post but don't underestimate the importance of giving your phone a "break" every now and then. The longer the hours you're using your phone, the more the data cached in its memory and while some of them will remain even after system reboot, majority of those will be gone so it's worth it. One of the signs that you're using too much memory on your phone is that it will turn incredibly slow. Of course you cannot dictate apps and services to minimize their use of RAM but there are things you could do to minimize the number of services running in the background. From the desired Home screen, tap and hold on the widget. Drag the widget over 'Remove' and release your finger. The widget will be removed and its service will stop after that. Tap either Wallpapers or Gallery. Find photos to replace your live wallpaper, or better yet, remove any wallpapers you have. From the desired Home screen, tap the Menu button. Tap and hold the Home screen and you want removed. Drag it over to 'Remove' and release your finger. Tap OK to confirm your action. While apps are very important in making your smartphone even more productive, they are the ones that eat up your phone's memory more than other services. Thus, it is imperative you manage them well to prevent your phone from lags, freezes and random reboots. Before you actually install the app you like, take a little time to read user reviews from the Play Store so that you would have an idea what the app is like when installed on your phone. Remember, not all apps could run smoothly on your phone regardless whether your device comes with high specs or not. If an app causes the phone to act abnormally, don't hesitate to uninstall it from your system and find alternatives. Or, you can try to disable it first and investigate if it's the one that causes the problem. If you suspect that the installation didn't go well, then reinstall the app. Tap the Menu button, then choose My Apps. You can either update all apps in one tap or update one app at a time. If you want to turn the Auto-update option, tap the Menu key, choose Settings and tick the checkbox beside Auto-update apps. If you feel that some apps you often use lag or responds poorly after weeks or months of use, it's a sign that you need to clear their caches and data. Tap Settings then choose More tab. Tap Application Manager and swipe to select All tab. Find and tap the desired app. Tap Clear Data button then tap OK. If you have plenty of apps that you don't need anymore, uninstall them to free up some space and kill their services to minimize the use of your phone's internal memory. Tap Uninstall then tap OK. NOTE: You need to clear an app's cache and data before uninstalling because some apps leave their data behind even after uninstallation. When you use an app and press the Home button, the app doesn't close but minimized, thus, it still runs in the background even if not in use anymore. Needless to say, it still uses a certain amount of memory. You need to clear those by closing recently used apps. From the Home screen, tap and hold the Home button. To close an individual app, touch and drag it to the right. To close all of them in one tap, touch the Clear All icon. Go back to the Home screen then tap the Menu key. Tap Settings, then More tab. Swipe to either left or right to view the Running tab. Find the Free value, that's the amount of free internal memory on your phone. Managing your Galaxy Note 3's internal memory helps a lot in prolonging its lifetime not to mention all immediate benefits you could get. While the device has been packed with a lot of RAM, it will run short of it after months of use if you don't take a little effort to manage it.